"This recipe came from a very old and dear friend, and it combines just the right amount of tartness and sweetness." To Make Lemon Filling: In a double boiler, combine cornstarch, sugar, and salt. Stir in water, mixing well. Cook until mixture is thickened, stirring frequently. Remove from heat. Place egg yolks in a medium bowl and beat well. Slowly pour 1/2 cup of cornstarch mixture into egg yolks, whisking constantly. Pour egg yolk mixture back into cornstarch mixture in double boiler, continuing to whisk constantly. Return double boiler to heat and cook mixture 2 minutes longer, stirring constantly. Remove from heat. Stir butter or margarine, lemon juice, and lemon rind into thickened mixture. Allow mixture to cool, then pour into pie shell. To Make Meringue: In a large metal or glass mixing bowl, beat egg whites until foamy. Add 6 tablespoons sugar a little at a time, continuing to beat until all sugar is incorporated and whites are stiff. Spread meringue into pie shell, making sure to completely cover lemon filling. Bake in preheated oven for 15 minutes, just until meringue is golden brown. Chill before serving. This pie turned out beautifully and was delicious. 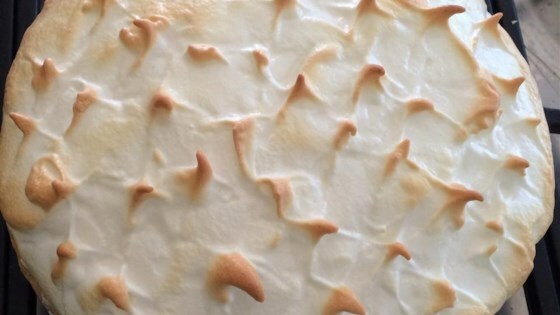 This is the BEST Lemon Pie recipe I have ever used. I have used the recipe several times, with consistantly GREAT results! It is always a hit at Easter and family reunions.